The summer exhibitions at ARTER display some of the most powerful contemporary art on show in the city right now – good to know in the lead-up to the Biennial. Whether aiming to shock or to delight, this pair of exhibitions certainly prompts viewers to question a thing or two. Each season, ARTER aims to exhibit the work of an established international artist alongside an up-and-coming Turkish artist. While the international artist’s show displays a large proportion of the artist’s oeuvre, centred on a chosen theme, the up-and-coming artist presents new work, supported by ARTER and its founding body, the Vehbi Koç Foundation. There is one other stipulation – both artists are required to provide at least one completely new piece to premiere at ARTER. The international artist featured this season is British-born and based Mat Collishaw. One of the Young British Artists – a group of visual artists, mostly graduates of Goldsmiths College, who have exhibited in London since 1988 and include such contemporary paragons as Damien Hirst and Tracy Emin – Collishaw is exhibiting in Istanbul for the first time (except for a work in the 12th Istanbul Biennial in 2011). His work – interlayered, exploring a myriad themes and referencing everything from contemporary news items to mythological figures – is dark. Very, very dark. The Istanbul-based artist Nazim HR Dikbaş describes Collishaw as someone who ‘opts to get his hands dirty’ in his essay in ARTER’s book published alongside the exhibition. This beautifully produced publication covers most of Collishaw’s oeuvre, with some fine writing from the show’s curator, Başak Doğa Temür, Dikbaş, and Guardian art critic Jonathan Jones – who likens Collishaw’s art to a ‘horror story’. I would have to agree with both Dikbaş’s and Jones’s statements. Collishaw’s work is unsettling. Its concepts deal with the darker side of humanity, exploring themes of violence, poverty, war, crime, disease and environmental damage. Collishaw grew up in a family of Christadelphians (a Christian group that originated in 19th-century England, believing in Biblical Unitarianism), and much of his work looks at religious themes and the often sinister nature of sects. This particular exhibition shows 18 works – all with creative and thought-provoking titles – dating from 1990 to the present day. Titled Afterimage, the exhibition centres on the meaning of that term – also called a ghost image – an optical illusion that continues to appear even after the viewer has stopped looking at it. Christadelphianism forbids the watching of television, so Collishaw grew up in a household without one. As a result his work is greatly concerned with questioning the media and its ability to feed us stories – often about tragedy and human suffering – which affect us but to which we become accustomed. Having seen these horrible images, we are able to forget them moments later. Collishaw manipulates photographs (both documentary and staged, but based on real events) with light or other technology to make us look for longer, to make us think – to create an afterimage. 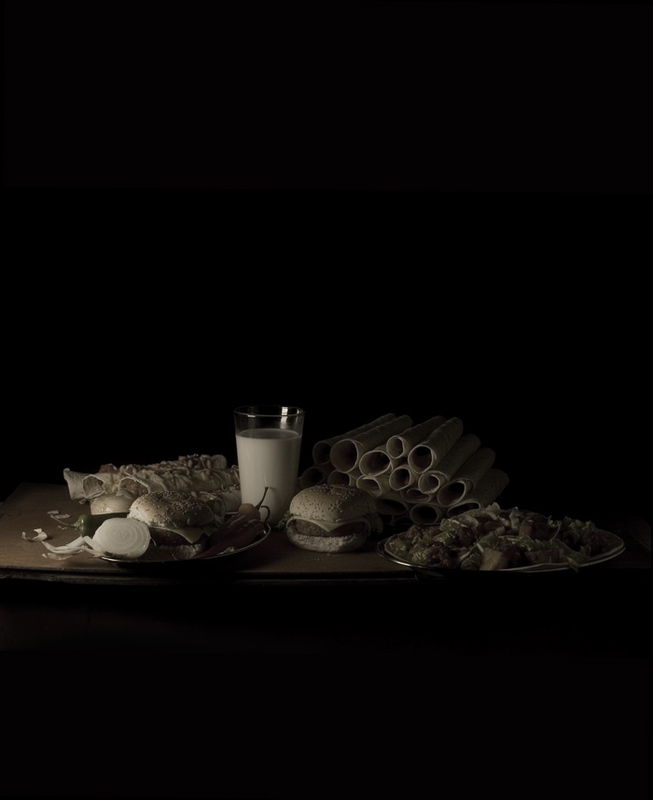 The work ‘Last Meal on Death Row’ (2010) is a series of 13 photographs showing what real convicted prisoners chose to eat before their date with the Grim Reaper. Each piece is named after the prisoner who chose that particular meal. Done in the style of 17th-century still art paintings, there is something beautiful and arresting when you first see them. But then as the story behind them becomes apparent, a far darker feeling sets in. The number 13 is significant, too – an allusion to the Last Supper of Jesus and his 12 disciples. In the ‘Garden of Unearthly Delights’ (2009) – a twist on the name of the 15th–16th century painting by Netherlandish master Bosch ‘The Garden of Earthly Delights’ – Collishaw was inspired by Victorian fairy paintings. 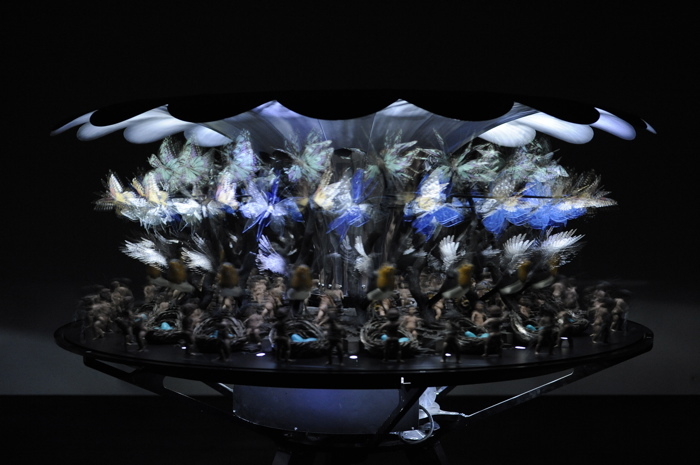 The characters form the scene created on a 3D zoetrope – a sort of modernised version of a 19th-century animation device, kind of like a mechanical flip book. As the machine rotates, an optical illusion is created whereby the little figures of ethereal boys from these paintings are shown slaying animals. Perhaps another comment on Christianity, this work is so hypnotic and puzzling, you cannot help but stare. The work’s meaning was summed up best by Temür, who told me it is about the ‘mayhem [that] starts when movement happens’. In ‘Children of a Lesser God’ (2007) (main image), one of his most famous works, Collishaw takes the subject of underprivileged children who live near his old studio in Bethnal Green, a suburb in East London, known for its large multicultural population and pockets of poverty. To ‘exaggerate their feral nature’, he constructs a scene based on the myth of Romulus and Remus, twin brothers raised by wolves; Romulus kills his twin and establishes Rome. This staged photo looks strikingly real and provokes feelings of both fear at the sight of the ferocious dogs so close to the babies and a degree of comfort in the knowledge that at least they have these dogs looking after them. ‘Prize Crop’ (2013) is the work that Collishaw made just for this exhibition. 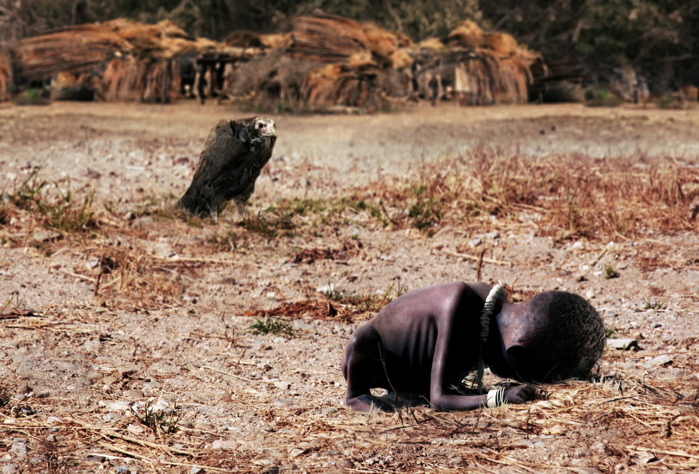 The imposing computer-generated photograph covers the whole wall and is a version of Kevin Carter’s 1993 Pulitzer-winning photograph taken during the famine crisis in Sudan. The photograph was steeped in controversy when it came out: had Carter taken the photograph and not helped the child? Or did he take it and then help the child? It turned out that in reality the child was not as close to the vulture as it seemed, and that this all took place near a UN centre, with the child's parents close by – which, according to Collishaw, makes the image in some ways mythological. It captures a very brief moment in time. Collishaw’s computer generation, on the other hand, makes the vulture move and the child’s body breathe, prompting us to consider the image on a deeper level. Carter committed suicide a year after the photograph was taken. Many thought it was because he was in turmoil over the controversy surrounding the photo. Collishaw takes a different view – he believes it was because Carter knew he could never take another like it ever again. Collishaw is indeed dark. Very, very dark. I recommend seeing Collishaw’s exhibition first and then making your way to Level 3 to see a much lighter, sometimes humorous exhibition from Volkan Aslan. It provides a nice, calm, but still thought-provoking conclusion to your visit to ARTER. Volkan Aslan is a young artist born in Ankara. 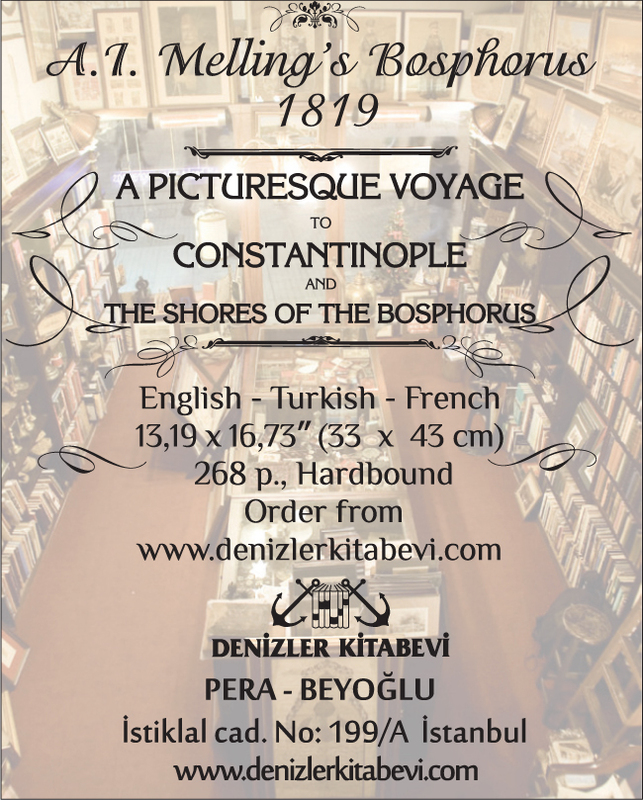 He has been exhibiting as a solo artist and in groups since 2007 all over Turkey, as well as in London and Berlin. In his new exhibition, Don’t Forget to Remember, Aslan uses the days of the week to question how the linear flow of time is interrupted by our memories. As we go forward in our lives, ticking off things on our daily calendars, certain events, people or objects thrust us back to the past as they trigger something in our collective memories. In a very personal exhibition, Aslan does this with the days of the week. Using various media and objects, he communicates to the viewer what each day means to him. Monday is a busy day of running errands for Aslan so this work, which he calls ‘Illuminated Days’, is about the fluorescent lights of bureaucratic institutions, banks for instance, that glare at him when he stands in queues to do these boring, but necessary administrative tasks. The pattern of the lights, however, draws inspiration from Seljuk and Ottoman motifs that Aslan first saw on the ceilings of his primary school. Tuesday is a day when not much happens. Titled ‘A day gone by, gone from life’, it consists of seven black-and-white photographs taken from the window of his studio at the Istanbul Traders’ Market. The repetitive movement of a man carrying a rolled-up carpet is the monotonous image stuck in Aslan’s mind. The piece to represent Wednesday is a video called ‘Where’s the water? The cow drank it’ which was shot on a sunny day during a seaside holiday. The video is shown on a screen split in three and attempts to comment on the similar symmetrical balance of the mid-week days. Thursday is Aslan’s happy day – it is the day he frequents art galleries and exposes himself to creativity. 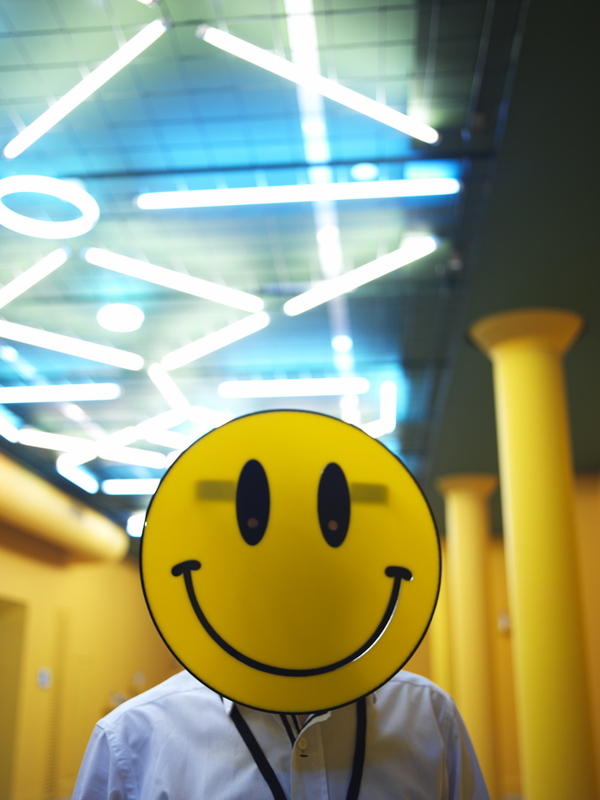 A mask showing the ‘smiley’ emoticon is the piece of this day and involves a performative aspect as an exhibition attendant, who Aslan specifically commissioned for the job, wearing the mask at the space during visiting hours, lending meaning to the work’s title, ‘Welcome’. Friday is a day of ‘Miscalculation’. 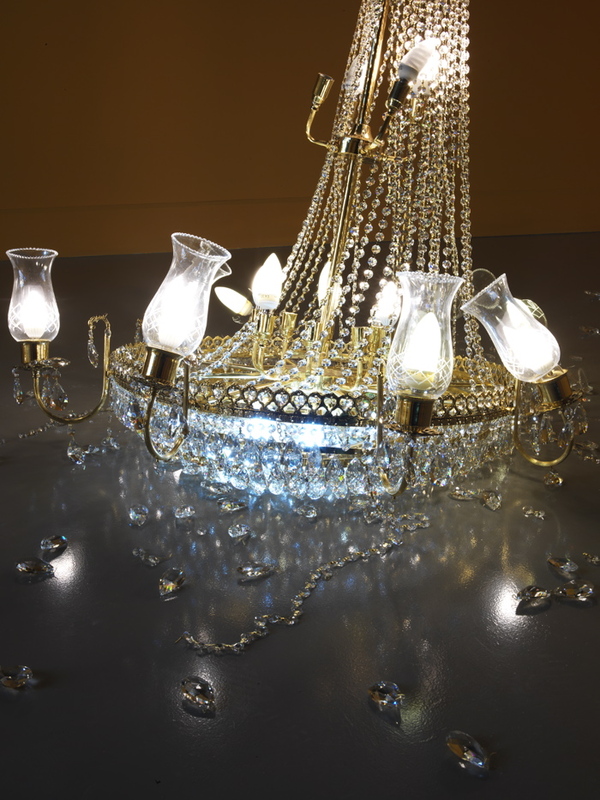 A crystal chandelier lies broken on the floor instead of hanging up as if the length of its cable was miscalculated while it was being hung. Friday is prayer day in Islamic culture and Aslan comments on a similar miscalculation happening at a mosque. Saturday is family day. 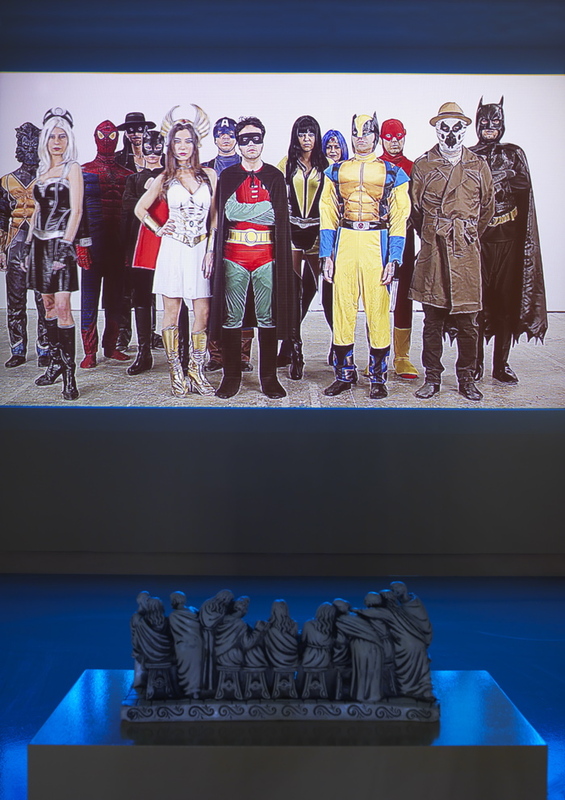 A carved sculpture of the Last Supper (spookily, it hangs two floors up from Collishaw’s work referencing the Last Supper) looks upon a large digital photograph of superheroes. Here Aslan references watching cartoons on Saturday mornings with his family – as did many of his generation, including me. As we grow older, our close friends also become part of our families, and Aslan assembled his friends, dressed in superhero costumes, for an unconventional family portrait. 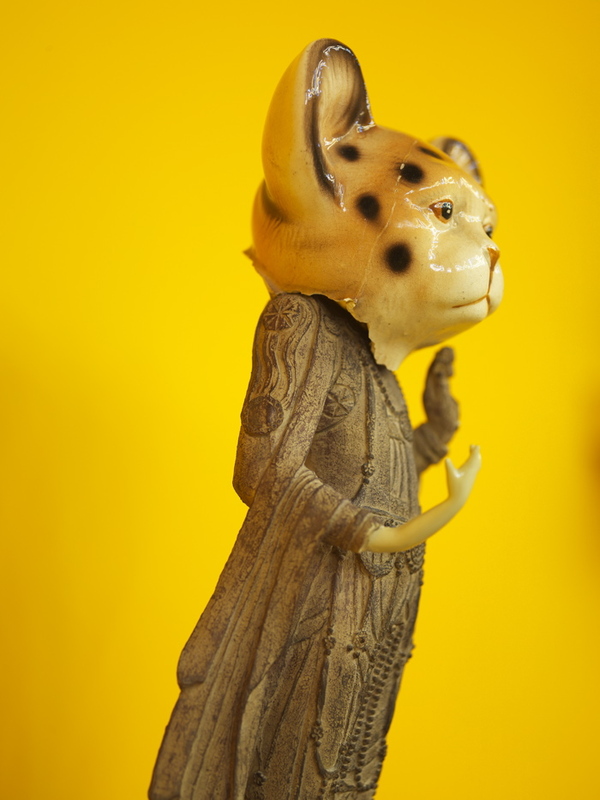 For Sunday, Aslan presents a collection of reconstructed porcelain statutes. Collecting these is a hobby of Aslan’s and he moulds them by gluing their broken parts to one another. Titled ‘Fragile’, it seems that here Aslan is commenting on the fragility we feel on Sundays, either as a result of a big Saturday night or because tomorrow is the start to another week. Sunday is also a family day. I remember having lunch at my grandparents’ house every Sunday as a child and my grandmother’s collection of porcelain figures, always hidden away in a glass cabinet, never to be touched. By presenting his personal memories, Aslan inspires us to not forget to remember.